I’m trying to rack my brain. Hard for me these days I have to admit but I’m trying to recall a scene from a film in which a small band of men are wandering with trepidation through a sinister, deserted and rather large stone passage-way. Suddenly massive, other-worldly stone giants come to life and slowly but surely break free of their surroundings. I’m half thinking that the band of men were, in fact, hobbits and the scene is from one of the Lord of the Rings trilogy but it’s been a while since I’ve watched those films so I’m not 100% sure. Anyway of the reason for the above ramblings is that this is what instantly came to mind when we walked through the huge hall of the Monument to 1300 Years of Bulgaria in Shumen for the first time. We were initially alone when we first emerged at the foot of the structure and entered its great hall and although the sun was shining and it was a pleasant day, there was an eeriness about the place that made us both look at each other rather nervously as we surveyed our surroundings and laid eyes upon the Teutonic-like stone giants that looked menacingly down on us from all sides. 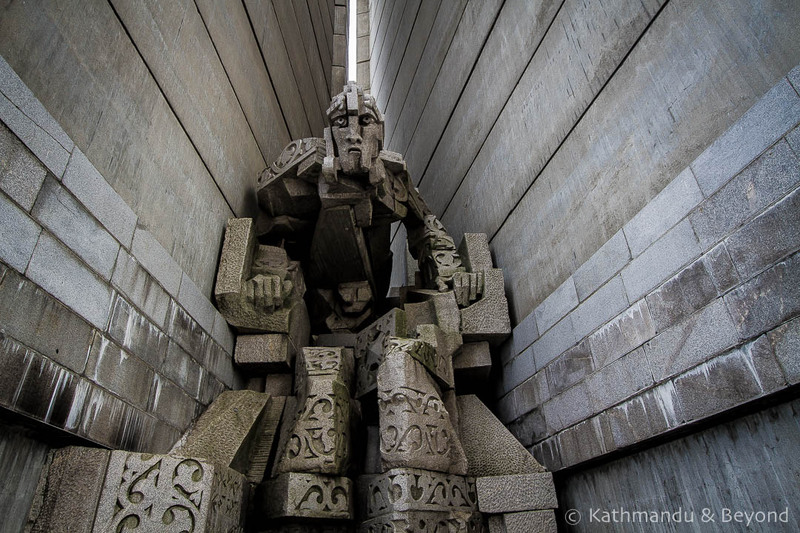 Sometimes called the Founders of the Bulgarian State Monument, this gargantuan Cubist-style memorial is incredible in every respect. The sheer magnitude of it alone is enough to impress even the weariest of traveller. It is also in very good condition. 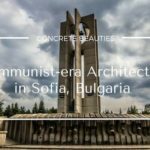 Many of the complexes built during the same period that we have seen throughout our travels in Bulgaria have either been abandoned to the elements or are in a terrible state of disrepair. This, of course, adds a different level of appeal to visiting them but the Monument to 1300 Years of Bulgaria is immaculate and regularly visited by Bulgarians, a point worth noting as this has certainly not been the case with most of the other places of a similar ilk that we have visited on this trip. Located on IIchov Hill, the structure is clearly visible for miles around (up to 30km according to some sources). 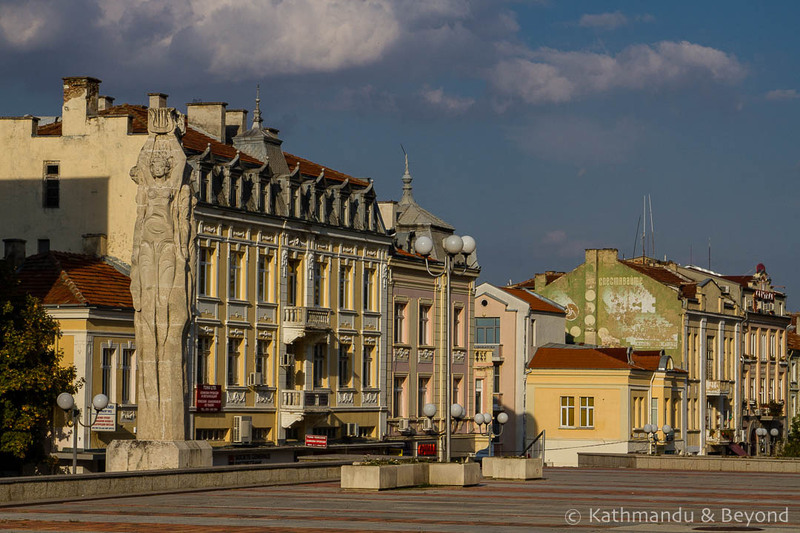 As the name would suggest, the monument was built to commemorate the 1300th anniversary of the founding of the Bulgarian state, the date of which was 681AD. Construction began in August 1979 and the monument was officially unveiled (how do you veil something this size?) on 28th November 1981. Some of the facts that are attached to the building are also cause for awe. According to the information gathered from the Visitor’s Centre (see below) and the Tourist Information Centre in the middle of town, the outdoor three-panelled mosaic is the largest of its kind in Europe. The stone sculptures (that initially gave us the hebbie-jebbies!) depict important khans (rulers) including Khan Asparuh, who is considered to be the founder of Bulgaria. What’s more, the granite lion atop the memorial weighs in at 1,000 tons while in total, 50,000 cubic metres of concrete and 2,400 tons of reinforced steel were used to construct the monument – that’s a lot of concrete and a lot of steel! And last but not least, the Monument to 1300 Years of Bulgaria is apparently a popular wedding venue. What a brilliant place to get married. If we ever decide to renew our vows, that’s the venue sorted! In conclusion, for sheer scale and impressiveness, the Monument to 1300 Years of Bulgaria has to be one of the most incredible structures we have seen in a long time (dare we say it, possibly more impressive than Buzludzha!). 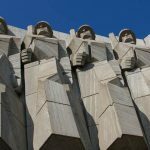 What’s more, Shumen is an appealing medium-size town in Central Bulgaria so, if you are in the area, we would definitely recommend a visit. There are reasonably regular buses to Shumen from Sofia and Varna as well as from other destinations within the country. We stopped over en route between Varna and Veliko Tarnovo for example. There are several hotels in town, including the excellent Hotel Solo (€25 a night for a room for two people), where we stayed. Next door a Chinese restaurant offers a welcome respite from the usual Bulgarian fare (something locals obviously appreciate as well – the place was packed both nights we ate there). 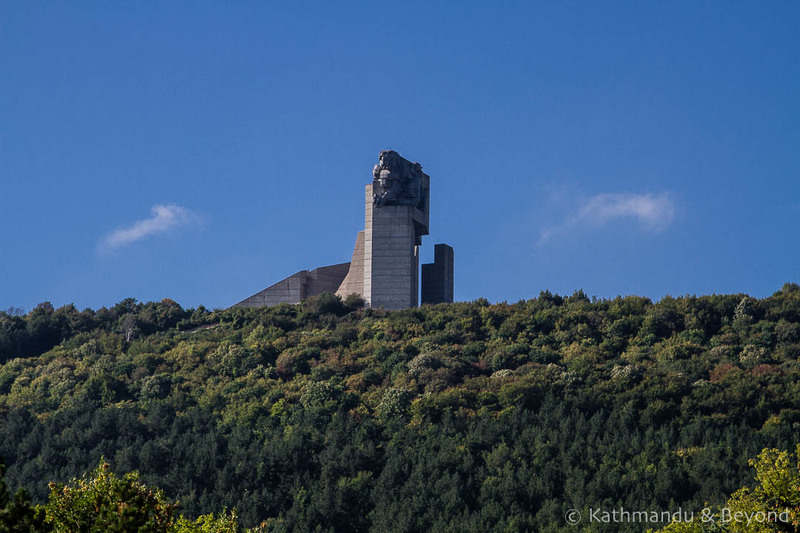 The monument itself is about 2km from the centre of town if walking and about 5km if driving. There is no public transport. The options are a) drive yourself, b) take a metered taxi (about 6Lev/€3 each way plus you may have to negotiate waiting time) or c) walk up (and down) the seemingly never-ending 1,300 steps which begin beside the History Museum in the centre of town. There is a path through woods and along the ridge (approximately 3-4km) that links the monument with Shumem fortress. If you have the time (and energy), Lonely Planet’s suggestion of taking a taxi to the fortress (4Lev/€2) and then walking to the monument and eventually descending the steps to the town (and downing a cold recovery beer on the main drag) is a good one. Assuming the sun is shining, the best time to photograph the monument is in the late afternoon. Getting a full frontal shot (and therefore a photo of the huge granite lion) is tricky because in order to do so it is necessary to head down one level and the view is then obscured by trees. With a decent lens, the best position for an overview shot is right beside the Partisan monument, which is to the left of the History Museum. There is a 3Lev/€1.5 entrance fee to enter the site. If you walk up the stairs, you will avoid the ticket counter and therefore need to detour out of the main hallway to your left in order to get your ticket. You can easily get away without buying a ticket but it’s worth doing so as you gain access to the Visitor’s Centre, which has some interesting information about the structure. These are beautiful and huge! So impressive! The detail going into these carvings Mark is stunning. Think of laying concrete on the ground. Tough to get it freaking level. Then think of shaping it. Even more difficult. Then think of crafting complex structures with edges, corners, going vertical, horizontal. Wow! Insane. Patience. Brilliance. Thanks for sharing! I was a 9 y.o. child when they raised that monument almost 40 years ago. I remember climbing that hill with my uncle before that (and nowadays with my nephew) and during the construction job. It was build with collective effort of people of Shumen. Although we, bulgarians in general, despise these grotesque gargantuan monuments raised virtually everywhere in Bulgaria, ours with its more than 1300 steps is so intense, that we think to ourselves that is almost worth it.